First off, where does one download it? Well that is one of the nice simplicity features of the plugin–you don’t have to! 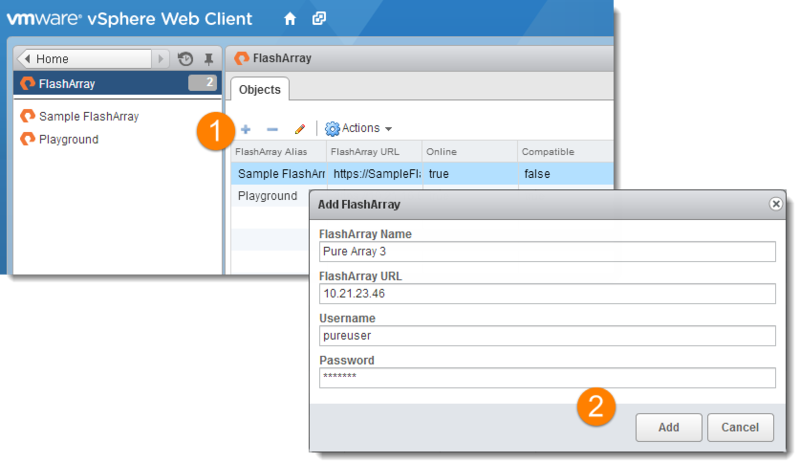 If you have a Pure Storage FlashArray you already have the plugin in your datacenter. The plugin is included in the controllers of the FlashArray and all you need to do to install it is to push it from there. Launch the Pure Storage GUI from any of your FlashArrays–it doesn’t really matter which one other than if one has newer Purity running on it. It would have the newest version of the plugin. Under the Systems>Plugins screen there is a vSphere item. From here you can import the plugin into one or more vCenter instances. Enter in the IP address of FQDN of your target vCenter server and appropriate credentials. Click “Connect” to query the status of the vCenter–this will check whether or not the plugin is already installed and what version is there. For a new install then choose “Install” for a existing one that needs to be upgraded choose “Upgrade”. Only takes a few moments and the plugin is installed. Simple enough! Now–to the Web Client! Now in the vSphere Web Client home screen a Pure Storage icon will appear. From with here is where you can configure which arrays you want to grant access to. This does not have to be the array you installed the plugin from–this process is mutually exclusive to that. A simple wizard requiring the IP/FQDN, an array name and credentials allows you to add a FlashArray. 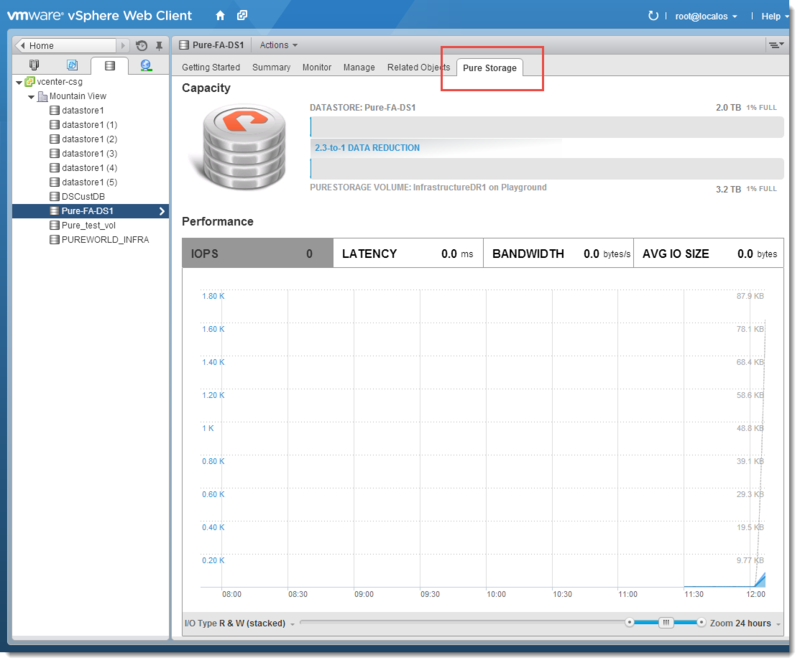 This will allow you to provision from and view underlying, in-context details of VMFS volumes provisioned from that particular array from within the Web Client interface. One of the most basic features of the plugin is the ability to see underlying storage information in-context of a given datastore residing on a FlashArray directly within the standard datastore views in the Web Client. 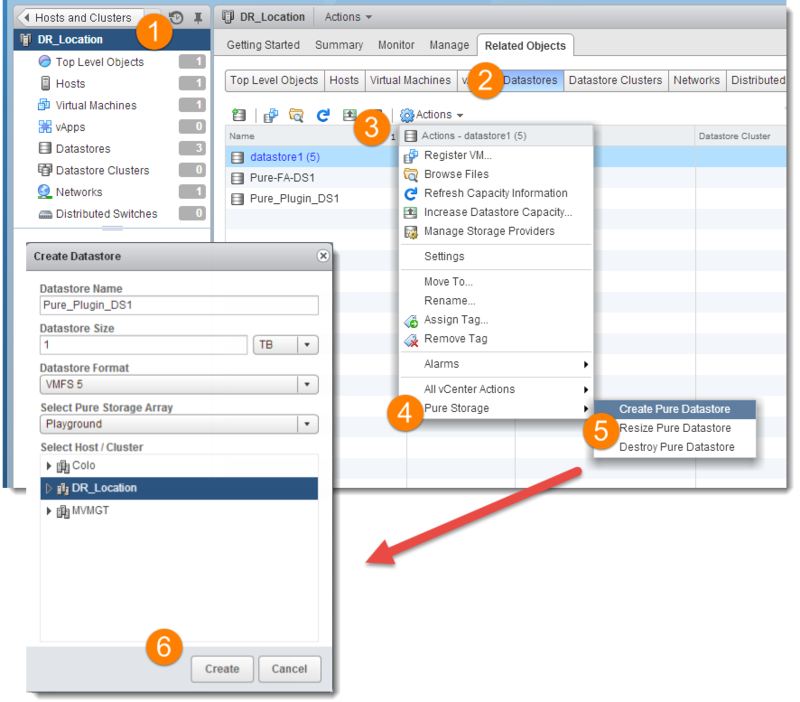 In the vSphere Web Client a new tab will appear for datastores called Pure Storage. From that tab, data reduction rates and performance information for that device can be seen. Provision new volume—this will create a new volume on the Pure Storage FlashArray and present it to a cluster. It will automatically rescan the host(s) and then format the volume as VMFS. Expand existing volumes—any existing volume on an authorized array can be non-disruptively expanded. The plugin will resize the FlashArray volume to the new size, rescan the host(s) and then automatically resize the hosted VMFS to encompass the new capacity. The only real requirement to allow provisioning is that prior to provisioning any new storage to a host or cluster hosts or host groups must be pre-configured on the array—the plugin will not create a host or host group itself. The plugin will recognize the proper host or host group and connect the new volume to the appropriate object. If provisioning to an individual host then a host group does not need to be created—just the host. If provisioning to a cluster there must be a corresponding host group pre-created that includes all of the hosts in the cluster. The interface requires you enter a unique name for the volume, if a name is entered that is already in use on the target array the provisioning operation will not be allowed until a unique name is chosen. The Pure volume name and the VMFS name will be the same. 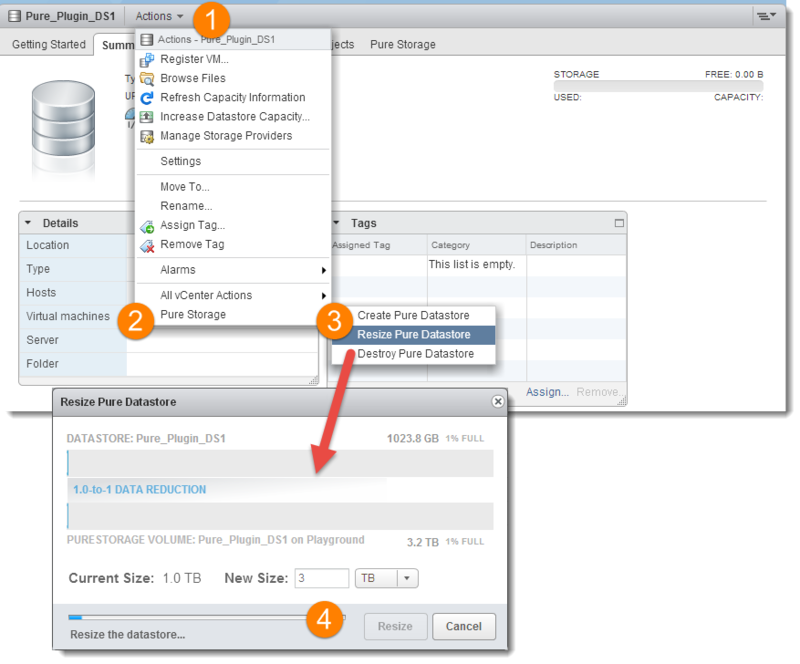 The resize operation allows you to increase the capacity of a datastore non-disruptively. 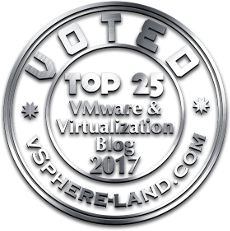 This process automates the entire process from the array to the VMware side of things: increasing the Pure volume size, rescanning the ESXi hosts and running the VMFS volume grow to include the new capacity. The VMFS volume is gracefully unmounted. The Pure SCSI device is detached from all of the hosts that have access to it. The Pure volume is disconnected from any hosts or host groups on the array. The Pure volume is deleted from the array. Will you ever have the plugin be able to apply all the PURE best practices to the hosts? Well the only real best practice is the multipathing rule, which is going away and unfortunately setting a SATP rule is not supported by VMware in their SDK, so we can’t add it anyways. But luckily that won’t matter moving forward. So which practices are you referring to then? I can see what I can do about those.